It’s so nearly spring, I am itching to get out and do some gardening, I’ve been getting seed catalogs, the siren song of the gardener. About a year ago (+/-) I discovered another method of raised bed gardening, it’s called a keyhole garden for obvious reasons, it looks like a keyhole from above. From what I can see, you make a round raised bed with a notch in it that goes to a central basket that holds compostable materials, kitchen scraps, fruit & veg, egg shells, coffee grounds (including the filter), paper, cardboard, grass clippings and the such. The garden is watered through this middle part, transferring the nutrients from the decomposing material in the middle to the garden that surrounds it. 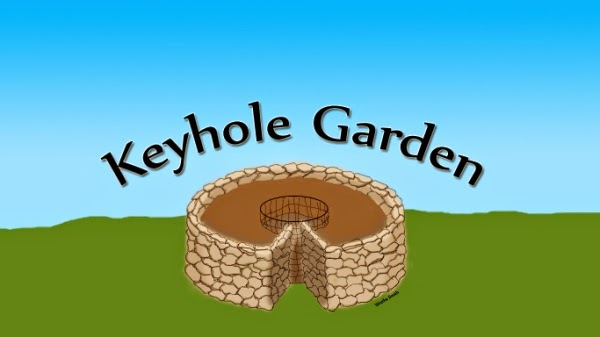 The notch is important, it allows easy access to the central basket to add more compost and water, you also need to be able to reach every part of the garden area, so don’t make it too large, you can always build more keyhole gardens as needed. I have seen many materials used for the outside, from bricks, to pavers, rocks, some are cemented in to make a permanent structure, others are just dry stacked so they can be removed later, it can even be made from wood, metal or plastic. I watched many videos on how different people make theirs, some do it very simple, others more elaborate, one I saw this evening looks pretty good, but I saw the builder do something I probably wouldn’t do, after marking out the circle, he used a fork to dig up the soil, the reason I wouldn’t do that is because you aren’t using THAT soil to plant in, you are placing layers of cardboard, paper and mulch type materials in the base, you don’t add soil until the last foot, so disturbing the base layer of soil is not necessary and it seemed to me it would be counter productive. Here are a few videos you can watch to get a better idea of how this is done, enjoy!